This shop has been compensated by Collective Bias, Inc. and its advertiser. All opinions are mine alone. #MyJergensGlow #CollectiveBias As a Master Aesthetician I’m all about having healthy skin, so it goes without saying that I don’t believe in using tanning beds. I like getting vitamin D naturally from the sun (with lots of sunscreen on of course) and looking perfectly sun-kissed by using JERGENS® Natural Glow® lotion. I’ve been using JERGENS® Natural Glow® since I was in college and the pleasant smell of it always takes me back to those care-free college days. I still love to use it to give my skin a healthy glow that also looks natural. I like that it comes in multiple shades so I use the lighter color in the winter and move to the darker shade for summer, and I love how JERGENS® Natural Glow® +FIRMING Daily Moisturizer firms my skin, moisturizes it and gives my skin a gradual glow at the same time. JERGENS® just came out with Natural Glow® Instant Sun® Sunless Tanning Mousse which I was dying to try on my white stomach… Seriously though, it was bad. 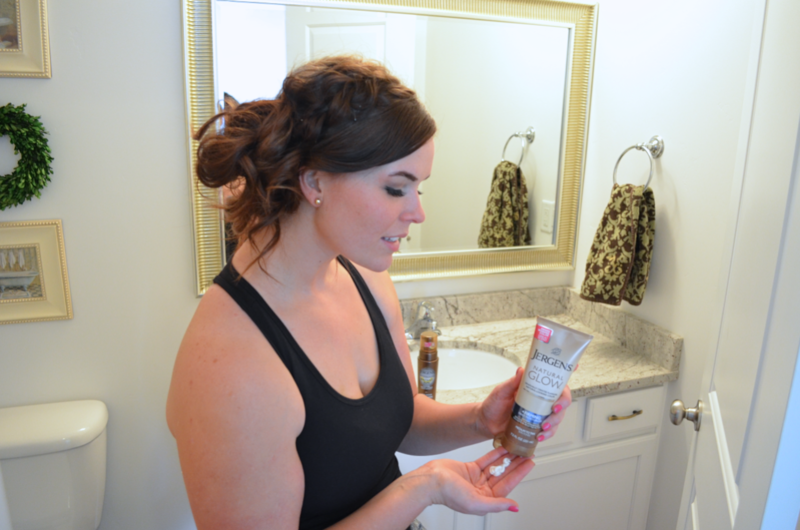 Since I’m basically an expert in JERGENS® sunless tanners, I wanted to share my best tips and tricks with you so you too can have a flawless application, avoid the bronzed hand look and steer clear of other common sunless tanning pitfalls. First up, trying the sunless tanning mousse. My number one tip when using a sunless tanner is to wear black. The last thing you want to worry about is staining your favorite yoga pants (yes, it’s happened to me before). So unless you plan to apply this product in the buff, black is best. For the most natural-looking color, be sure to exfoliate before first use, then make sure to apply regular lotion to your hands, elbows, knees and ankles first to avoid build up (still use sparingly in these areas, think half as much). Apply a few pumps of the sunless tanning mousse to your hands and rub in evenly, using more as needed. I’d recommend starting with one layer and adding more at least 5 minutes before you apply the second coat. You can add more every couple of days until you reach the desired tone. As you can see in my picture, it starts working right away. After applying Instant Sun and washing your hands thoroughly. Do not shower for 4-8 hours after application of Instant Sun, and try to avoid wetting your skin for a full 8 hours for best results. The same rules apply for the firming glow moisturizer: wear black, exfoliate, apply lotion to your hands, elbows, knees/ankles and apply about half the amount needed on those areas. If you’re new to these products, and you’re not sure which color to try, just know that they are very forgiving and it really takes multiple applications to build up the darkness. If you’re still nervous, go with the lighter shade. I love to apply this lotion sitting on the bathroom counter. Its easiest if I sit right at the edge so I can prop my feet up on the toilet and sit for a few minutes to let the lotion dry. When I’m done, I immediately wash my hands with soap and water making sure to scrub in between my fingers well. After drying my hands on a towel, I’ll go over my elbows, knees and ankles with a light buffing. I find that this blends those dry skin areas and gives me more natural looking results (again the darker the towel, the better). I can’t wait for summer, swimsuits and short-shorts. I’m going to continue building my tan so I can feel more confident in my swimsuit this summer when the pool opens. I plan to spend the entire summer out at the pool and began putting my pool bag together, because you’ve got to be prepared for these things. Mine includes; sunglasses, a big hat, healthy snacks, fruit infused water (my go-to is lemon slices and fresh strawberries) an oversized beach towel and headphones. You can find the full JERGENS® Natural Glow® line at Walmart in the standard body lotion aisle. Also, look for the bright pink coupon on special bottles to save $3.00 on any 2 full size JERGENS® Natural Glow® products (Offer excludes trial and travel sizes). My Walmart had a special display with them right off the makeup aisle. Which are your favorite Natural Glow® products? Do you prefer a gradual self-tanner or an instant mousse?